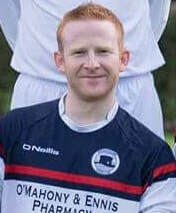 The former Terenure Rangers man is an energetic and skilful midfielder, comfortable on either foot. Having made a couple of appearances for the seconds early in the 2017/`18 season, "The Red Panda" made an immediate impact when called up to first team duty in an LFA Junior Cup match against Confey FC, scoring with virtually his first touch after coming off the bench. He established himself as a fixture for the Majors side during the 2018/19 campaign, operating at left back as often as in midfield.